"What gifts hath fate for all his chivalry? Honor, a friend, anguish, untimely death." "In the North...there are signs of a breeze that may trouble the waters. There is no reason to believe that the IRA is in a position to carry out any grand strategy. The odds, in the Republic and the Six Counties alike, are balanced too heavily against it. No sane Irishman wants any more of that hopeless nonsense. At the same time," he continued, "the fanaticism of such members as it may have has not diminished; and a man with only one idea in his head is always dangerous..."
By evidence and logic, the IRA certainly did seem to have disappeared. But rarely in Irish history have events progressed according to those two. In reality the IRA did have a grand strategy, thanks to a former Irish Army officer, Sean Cronin, and his idea was called "Operation Harvest." By his plan, the IRA would strike across the border from the south using mobile, well-armed columns of 12-15 men. Their attacks on the British Army and government infrastructure would make the country ungovernable and inspire the nationalists to rise up. They would be assisted by smaller Active Service Units of northerners and southerners fighting full time, and the local units that existed around the north. The few dozen men under Jim Rowntree that comprised the Newry unit were of the latter category. They were "local men," whose role was to "work during the day, go about their normal routine, and then strike at night. Their job is to stay constantly on the offensive, keep the enemy off balance and keep him guessing." Although far removed from the (skin deep) romance of flying columns dashing across the hills, they did the crucial grunt work of the army: gathering intelligence, sheltering men and hiding arms, providing guides and for the ASUs and columns, carrying out support operations and sabotage, and making sure the army maintained a presence overall. They had the camraderie that comes from small numbers, common sacrifices, and shared secrets. In 1956 Cronin wrote a "Handbook for volunteers of the IRA" to prepare them for the job they were about to undertake. Cronin was a journalist by trade, and typical of his writing it is precise, well-detailed, and owing to his army background, a cut above the average guerrilla cookbook. "The Guerilla must always remember that his main job is the destruction and breakdown of enemy communications, administration, and supplies," Cronin writes. This would primarily be done by local units, and their tools to this end would be explosives. The handbook describes the appearances, uses, and storing methods for gelignite, 808, TNT, ammonal, wet gun cotton, plastic, and 822, in addition to several paragraphs on bangalore torpedos (useful against "enemy tanks and barbed wire") and the three primary detonators. Gelignite, ("brown, used for cutting. Initiate with primer. Can be initiated with bullet. Keep in cool place. "), was the only one the IRA made a habit of using. It was the most readily available, having a legitimate use in quarries and mines, and could be obtained from them legally under the disguise of "stuff exports." It was the most stable, and can be knocked around without setting off the charge. And it was the most familiar, having been used for several generations going back to the Fenians. "Wee Joe," Seamus Trainor, and their generation were versed in its use. Many Old IRA men who bedecked the Easter Parades had used it in their day, and an early form was used by their predecessors in the IRB. The primers and fuses which make the stuff go off were another story. One had the option of electric fuse or copper wire, and they were more volatile than the explosive itself, particularly when exposed to moisture. It was not unusual they failed to work but many volunteers, happy to get away from the scene after working in the dark with one eye watching for police, did not usually risk their lives and freedom to go back and fix it. On December 12, the campaign opened along the border with a salvo of raids and attacks; watching and listening for the explosions across the border one volunteer thought it looked "like the western front." The original plans for South Down were: "Destroy Territorial Army station at Newry and burn down courthouse. Destroy Banbridge Territorial army Station. Seize short-wave Radio transmitter in Newry shipping office. Hit Warrenpoint R.U.C. Barracks. Raid Bishopscourt Radar Station. "A variety of factors worked against all these being carried out. The party assigned to raid Bishopscourt set out but was forced to turn back and in the end only a hut in which B-Specials drilled in Newry was attacked and mostly burned down. The columns that marked activity in the western counties were absent from Co. Down, and the area was quiet over Christmas. A column of volunteers from the southern side of the border moved into the area around New Years. They set up a staging point for operations at a lonesome farmhouse a full mile off road in Clontifleece- a "wild and sparsely populated" area at the base of the Mourne mountains. They were joined by three locals to help and guide them, Christopher and Bernard Loy, and Thomas Kearns. These latter three, along with Seamus Hand, Peter Duffy, and Pat Shaw of Dundalk, and Pat Considine of Dublin from the column torched a B-Special barracks the night of January 2nd-3rd. Unknown to them as they hiked cross-country back to the farm, the authorities were on to them and a landrover of six policemen armed with sten guns and revolvers was approaching from the other side. As they jostled up the long rocky lane they passed the farmer walking away the house. They stopped the car and split up, approaching from different directions. The ASU had apparently sensed the presence of the police, and was crouching along the wall of a pen while one man leaned over to dump their materials in it. A policeman, armed with a sten, came up behind. The others were soon on the scene and the ASU, in no position to shoot it out or escape, was captured. They calmly stood up and assembled along the farmhouse wall. The police, outnumbered and in dark, unfamiliar surroundings pressed the volunteers with shouting, threats, and prodding with their stens to disclose where their explosives were. None gave an answer and no explosives were found in the area, although in various places around the pen and in the haversacks each was carrying were tell-tale detonators, small arms, knives, copies of Cronin's manual, and ordnance survey maps. A lorry arrived on the scene shortly and took them away. This means 12 years for us, one remarked grimly. Although that imminent sentence hung over them, they played it cool at their trial, chuckling at inside jokes as evidence was brought forth and waving to some women in the gallery. It wasn't as bad as predicted: they got 8 years each. The following day over 500 police and members of the British Army carried out one of the largest sweeps seen in South Down for some years. They combed the Mourne mountains and arrested two hapless volunteers who were caught in daylight on the barren landscape with nowhere to hide, and uncovered a dump of the usual items near Rostrevor. House to house searches followed. On the 9th a false alarm provided some comic relief when a parachute with a "small object" descended out of a clear blue sky and came down in the middle of the road. Those watching assumed that this was an innovative new weapon of the IRA, and took cover. Before the bomb squad got there a taxi man ventured to pick it up. It did not explode: it was a meteorological instrument that had run its course. There were similar scares throughout the spring as ordinance and ammunition were found around disused installations that housed the US Army during WW2. On February 22nd, about 40 Territorial Army members were drilling in one of their huts on Downshire road. They left for the much-awaited canteen. Half an hour later an explosion from under the hut gutted it, leaving only the frame and blowing out the roof, windows, and sections of the floor. A comedy of coincidences prevented casualties. Two men on their way to relieve the sentries, and a caretaker who just happened to be outside were all shielded from injury by a landrover, and the sentries were protected by the sandbags around their post. The men in the canteen were thrown to the floor like ninepins but, aside from scrapes, bruises, and a bump on the head for one who was struck by a wireless transmitter, all were fine. This attack, like the previous two barracks bombings in Down, was timed specifically for when they were empty so as to avoid casualties: the objective was to deprive the police and TA of their safe places, rather than to rack up a bodycount. This attack prompted more searches through the mountains. Through late February and mid March targets in South Down focused on telephone transformers, wires, and kiosks to isolate communications, and some bridges were damaged in attacks to isolate troop movements. The Fianna were tasked with the former job of cutting wires, done by hurling over a rope with a stone attached and pulling them to the ground. Flickering lights and momentary power loss to the sound of not-so-distant explosions were common. "Once (indeed more than once) it was the local (transformer) on the site of the present Southern Regional College," writes one local. "For minutes at a time (or so it seemed) the sky was filled with multi-coloured flashes, then all went dark." The British for their part took to felling bridges to isolate IRA movements and it was not always clear to observers who was responsible for what. To control traffic they made roads some impassable by alternately blowing very large craters in them, or placing iron spikes, or concrete blocks in the way (or a mix of all 3). By 1958 only a handful of the 180-odd roads across the border in the north were open, and travelers on these ran a gauntlet of searches and roadblocks by the RUC, and B-Specials, and less commonly the British Army. There was an old abandoned house on Chapel Hill the police frequently raided, believing it to be a hideout. Their searches brought nothing by way of volunteers, but on March 1st they found a bomb waiting for them with 28 pounds of gelignite primed to go off. The police deferred to an army bomb disposal expert, who claimed it was the most complicated device he had encountered. On March 6th, in a fairly straightforward operation, an explosion leveled an army recruiting office which had just opened in November. The issue of army recruitment was one that would surface later with more drama than a simple explosion. Just after this, two volunteers "borrowed" a taxi cab for an operation, long enough beforehand that the owner reported it stolen. Around 8:15 in the evening, residents heard them racing up Frances street, accompanied by the sound of the Electricity Board's windows shattering as a bomb was hurled through. The volunteers ditched the taxi a hundred yards way at Merchants Quay, unharmed and ready to resume its legal use. But there was no explosion. The street was closed and the police and fire brigade watched as military disposal experts were called in. They found a 2 foot long iron water pipe with 75 sticks of gelignite stuffed inside, along with a 12 foot fuse that had burned out only an inch and a half away from detonation. Speculators pointed out a garage with underground petrol tanks was next door, although whether they intended to cause an explosion with that, or if the gelignite was capable of doing so, is debatable. The street was then reopened. On March 11th William and Sheila McCormick resumed life at their respective places of work after a five-day honeymoon. Around midday, word went around Sheila's workplace that police raids were going on- an unusual occurrence as their usually came around in the early morning. On her lunch break she asked a neighbor what the "sceal" was and the reply was that William had been taken away. The police had arrested a total of seven volunteers in precise daytime raids: Oliver Rowntree, Vincent and William McCormick, Bernard Larkin, John Duffy, and Lennie and Edward Campbell. Sheila appealed to Joe Connellan for help, who called for William's release without result. The Easter commemoration that year was one of the largest in recent memory. The streets were flooded by a sea of over 5,000 people, who left just enough room for the Old IRA veterans' color party to lead the procession through. Their route passed through a police cordon and there was no chance of the tricolor passing it; the flag was kept hidden until they had gone through, whereupon it was pulled out and triumphantly borne aloft to St. Mary's Cemetery by Bob Savage. Dr Padraig O Cuinn read the proclamation and led a decade of the rosary, after which four buglers sounded the last post. The police arrived at Bob's home in the early hours next morning and arrested him for the tricolor stunt. A few days later in court, the judge ordered him to pay 10 pounds. Bob was released but promptly ignored the fine out of principle; he ignored the reminders and finally in September he was arrested and given a month in jail for non-payment.
" I am proud to claim I have been a member of the republican movement for a long number of years. And if I may be allowed to say so, I am proud to be the first member of the civil arm of the republican movement to be charged with this offence, if it is an offence...I have been a member of the Republican movement since I was a youth of 11 years, and I have continued my association with the movement from that time to the present time and I have no regrets in that connection. 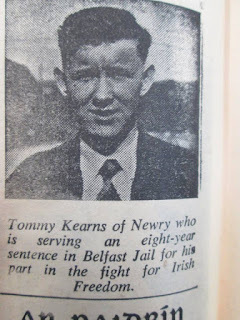 "I hereby state and proclaim the fact that I am a soldier of the Irish Republican Army, and I am proud of my connection with that organization. That about sums up all I have to say. (Then, in Gaelic:)Long live the Republic. The "sassenachs" sentenced him to nine months in the Crum. A crowd showed up to cheer him on and as he was led away to the police van a lady broke through to give him a cigarette. He joined the growing list of incarcerated Loy's. Such arrests were doubly significant as the men of Bob Savage and Christie Loy's generation were an inspiration for the movement. The Tan War Flying Columns were the basis for Sean Cronin's campaign. The young volunteers grew up in the shadow of their exploits and looked back a little longingly for the days when a republican soldier could fight such a war. That some of them remained involved over thirty years later gave both impulse and a sense of legitimacy in the movement's undertakings. After Bob Savage raised the tricolor, someone had the presence of mind to take a picture showing the color party and their flags marching towards the camera head on in all their determined glory. Under the tricolor, a few steps behind Bob, one can make out a young teenager, much smaller than those around him but well dressed and with accomplished air of an older volunteer. 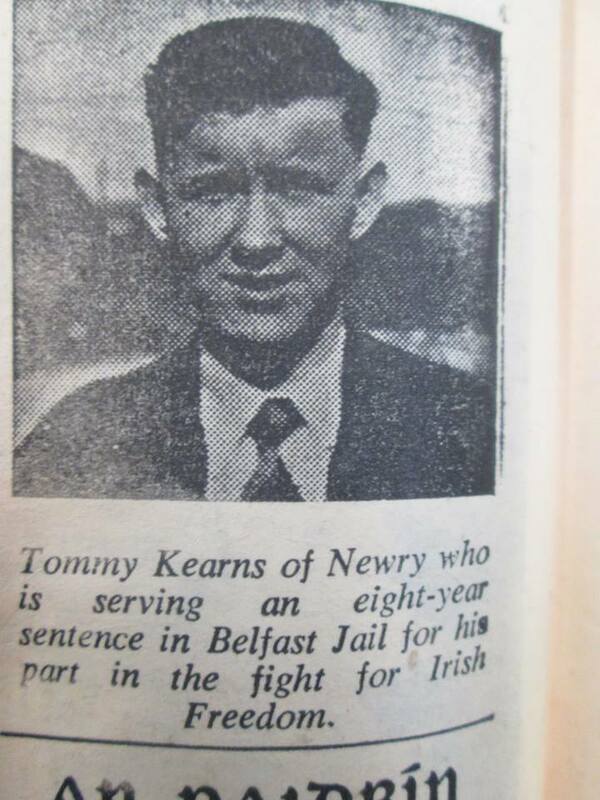 This choir-boy face was actually the brains behind some of the explosions that rocked Newry. 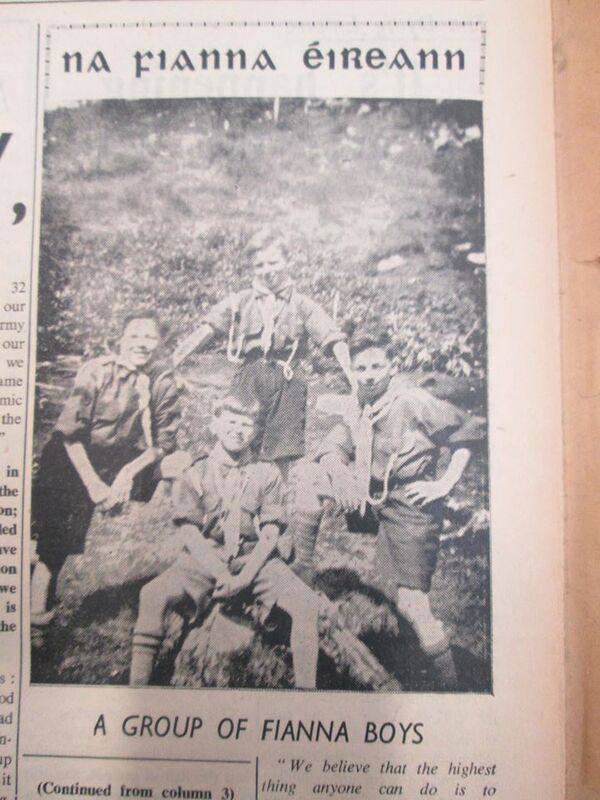 The rebel of his family, Dessie Mathers joined the Fianna in 1955 at the age of 12 and loved the republican lifestyle. 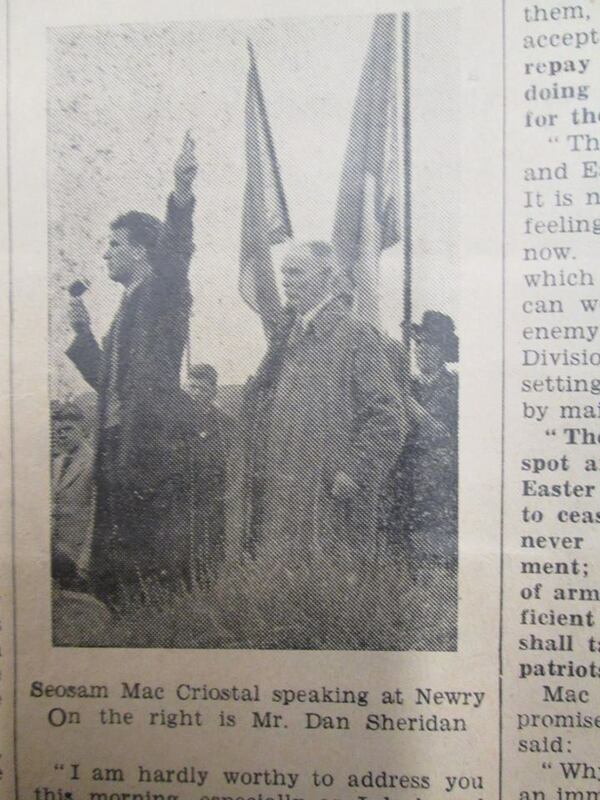 The Newry Fianna was the first in the north to show itself publicly since the organization disintegrated in the 40's, marching in uniform at Easter in 1952. They had around half a dozen boys, including Oliver Craven, whose fate was then quite unknown as they marched in their green uniforms and slouch hats looking very much like the first Fianna boys of 1909. Selection was rigorous, and took into account their moral background rather than purely physical abilities. Theywere expected to parade twice a week, drill, and attend classes on Irish language, history, and politics. There was scout-style training consisting of camping out in the country over a weekend. Weapons training was forbidden, but smuggling them, and the construction and transportation of bombs was not- it was a time honored Fianna service to the active volunteers dating back to the days of the Howth Gun Running. In this field Dessie discovered a talent. However, his mother was unaware that there was more to the Fianna life than parades and dress uniforms. This had complications for the boy, who was barely out of primary school. One time he missed his brother's wedding so he could attend a training camp in Omeath, for which his Ma "battered him." Later, when working with bombs, he would arrive home reeking of unknown odors (gelignite), for which he was further battered. Facing his mother was only slightly less frightening than cutting live telephone wires; or the bomb he set which failed to explode, and Dessie undertook the job which earned British sappers respect from their IRA opponents, that of disconnecting a live and volatile explosive. Anecdotes of his hijinks abound. One day while his brother was playing in the street there was a "heavy" explosion, the sort whose concussion left both houses and people trembling far away from the epicenter. "Its the end of the world," an old matron shrieked. Reality was more mundane- it was his younger brother at work. Another night a girl was in the process of "getting it on" with a boy whom she had been eying for some time without success. They went into the backyard and just as she was about to kiss him the mood was interrupted by an explosion. The lights went out, and in the darkness she watched a small figure hop the fence behind her and ran away. It was some time later when she met her cousin's boyfriend and instantly recognized him as the shadow than ran through the yard that night. Dessie was known to her as "Blackout." In the midst of this he was still attending school, and played on the local soccer team. He was a messer by nature and was not about to let a little thing like age get in the way of something he liked doing, although he earned the unsurprising sobriquet "The Child" from the other volunteers. He would leave his mark on the town before the campaign was over. On the night of May 12, two lorries of "masked men with blackened faces" approached the Victoria locks, which guards the opening of the Newry canal, built as an artificial link for shipping between the industrial city and the sea. Three approached the small wooden house on site where the lockmaster lived, relieved him of the keys, and told him and the family to get away quickly. They then accessed the locks on which two gelignite bombs were planted. They watched them detonate from the shore before driving across the border. The operation was carried out swiftly, for the gatekeeper and his family had only gone a hundred yards up the road when they felt the explosion. No one was perhaps more surprised with this than the local IRA men. Reports of sabotage by masked men with guns were taken to refer to them without further inquiry. In this case it was not so: Jim Rowntree had not cleared any such operation, and the army foresaw with horror the political fallout this could produce. They called the Urban Council Chairman, "on behalf of the Adjutant General (Charlie Murphy)" of the IRA and denied responsibility. They then distributed a statement around Newry declaring they had no hand in the explosion and decrying it as the work of "pro-British saboteurs." "First, to strike what was hoped would be a crippling blow to the economy of the Newry area- a nationalist stronghold- by stopping all work at the port. "Second, by putting blame on the resistance and so give it a bad name among the Nationalist people of Newry. "Storemont has been unsuccessful in the second of these aims and only partially successful in the first." "It is not part of (our) campaign to engage in operations designed to damage the material interests and welfare of any section of the Irish people." The statement, which was reproduced in the next issue of the United Irishman, went on to try and find gaps in the evidence as reported in the papers. They even posted photos of government leaders repeating the accusation beneath as if they set the fuses themselves. The explosion was actually the work of Saor Uladh, backed up by the Dublin-based Christle Group. The latter had stolen the gelignite explosives from stores in the south, and thanks to a masterful explosives expert they destroyed the target rather than simply causing some damage, or worse, a burned out fuse as was the result of so many operations. In J. Bowyer Bell's words, it was "immense damage at a minimal cost." And their volunteers were not a little put out at the IRA's denial. They considered it to be akin to "felon-setting" and "aiding the (authorities') process of elimination" against the interests of a group fighting against a common enemy, and whose help the IRA availed themselves of when it suited the leadership. In any event, the Victoria Locks bombing is often to this day mistakenly blamed on the IRA. "A new generation has come of age since these men fought- a generation which has inherited the ideals for which they died. ...Here today, in this spot and during this peaceful feast of Easter we promise: never to yield; never to cease our efforts against the enemy; never to cooperate with the government; but to train ourselves in the use of arms, and having made ourselves proficient with the weapons of war we shall take up the fight where Newry's patriots fell." "Is it for using moral force that Joe Campbell and our fellow republicans are this day confined in the penal cells of English prisons? The answer is 'no' and the reason is obvious. England has no cause to intern anyone advocating moral force, because such a weapon can never harm her. . ."